Early C16. West tower. Flint rubble with dressed stone quoins. Brick crenellations. 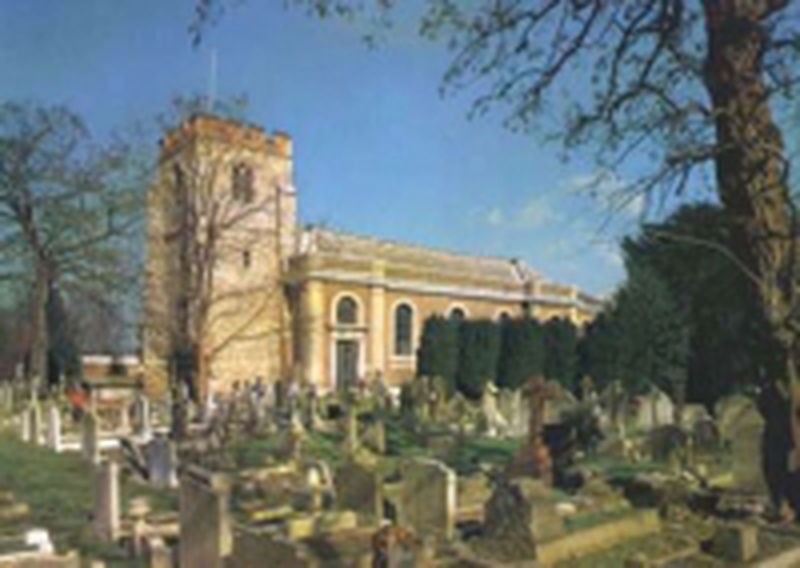 The main body of the church was rebuilt for the Duke of Chandos by John James 1714-16. Unassuming brick exterior with undecorated stone arched windows and broad Tuscan corner pilasters. The interior is lavishly painted in a continental Baroque manner. At the west end is a gallery built to seat the Duke and his family with a wide arched, semi-domed centre section. The nave has an elliptical barrel vault and opens without a break into the choir. At the east end is the retro-choir which is dominated by the curved wooden organ case and its flanking paintings. The opening, to the retro-choir is framed by finely carved pairs of columns and pilasters in antis surmounted by a broken cornice and segmental pediment. Both this woodwork and the organ case are attributed to Grinling Gibbons. The complete painting scheme is by Laguerre, with the exception of the Nativity and Pieta on the east wall and the transfiguration in the gallery which are attributed to Bellucci. The walls are painted with trompe l'oeil niches with figures of the Evangelists (north side) and Christian graces (south side). The nave ceiling has arches painted as if coffered dividing it into eight panels depicting the miracles and teaching of Christ. In the ceiling above the choir is an adoration of God represented by the name YAVEH in Hebrew, characters in the centre of a blaze of light. Other surviving original features include the box pews and decorative ironwork. Attached to the church on the north side is the Chandos Mausoleum decorated in a classical trompe l'oeil style by Brunetti. Sculptured monument to the 1st Duke on west wall (attributed to Grinling Gibbons) with a figure of the Duke bewigged and dressed as a Roman in centre separated by plain pilasters from his two wives, Mary and Cassandra who are kneeling on either side. Two monuments on south wall one a black sarcophagus placed against a white pyramid to Mary wife of the 1st Marquess of Carnarvon (died 1738) by Sir Henry Cheeve and the other a large white sarcophagus with curved fluted ends to Margaret, Marchioness of Carnarvon who died in 1760. Other C18 monuments in base of tower.